Dolphins, whales and porpoises have extraordinarily small balance organs, and scientists have long wondered why. Now a study at Washington University School of Medicine in St. Louis has contradicted a leading theory, which held that the animals moved their heads so vigorously that they had to have smaller, less responsive balance organs to avoid overwhelming their senses. Working with a Midwestern zoo and a local rancher, the researchers, led by Timothy E. Hullar, MD, a Washington University ear, nose and throat specialist at Barnes-Jewish and St. Louis Children's hospitals, directly measured the head movements of dolphins and compared them with those of a closely related land animal — a rodeo bull. Cattle have much larger balance organs than dolphins, yet the tests showed that both species had similar head motions. The findings will be published in the April issue of the Journal of Experimental Biology. Hullar says the results deepen our understanding of the role of balance systems, including those of people. Much of an animal's or person's balance is controlled by the semicircular canals located in the inner ear. Even though a bottlenose dolphin is about 8 feet long, its semicircular canals are as tiny as those of the average mouse, an animal that could comfortably ride on the tip of the dolphin's nose. "About 35 million years ago, the ancestors of whales and dolphins went from a terrestrial habitat to an aquatic habitat," says Hullar, assistant professor of otolaryngology and of anatomy and neurobiology. "During this evolutionary process, their semicircular canals got smaller and smaller. The scientific thinking has been that since the canals measure head motion, something must have changed a lot in how these animals move their heads." Hullar points out that the general trend is for vertebrate semicircular canals to be proportional to body size. Since dolphin canals are so much smaller than the rule suggests they should be, perhaps, scientists thought, dolphins move so much that a large balance organ would be too sensitive to work properly. Dolphin trainers at the Indianapolis Zoo agreed to work with Hullar and Benjamin M. Kandel, a Yeshiva University undergraduate student conducting summer research in Hullar's lab, to measure dolphin head movement to test this hypothesis. "They were glad to help because zoo dolphins aren't there just to entertain but also to help educate us about the species," says Hullar, who is also on the faculty of the Program in Audiology and Communication Sciences of the Central Institute for the Deaf at Washington University School of Medicine. 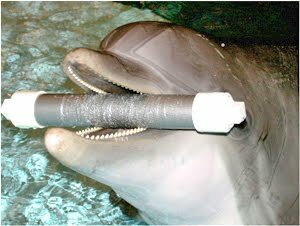 "They trained their dolphins to carry in their mouths a plastic pipe that contained a gyroscope and recording device so we could precisely measure their motion. Our study is the first to directly measure the head motion of dolphins." Next, the researchers had to find a land animal to match the dolphins. Two-toed animals such as pigs, camels and hippopotamuses are closely related to dolphins. So are cattle. So when one of Hullar's patients turned out to be a rancher, Hullar asked him if he had any bulls he could work with. He didn't, but he put Hullar in touch with a neighbor who raised bulls for the rodeo circuit. "I called him, and he said 'come on down' and directed me to his ranch in southeastern Missouri — part of the directions included making a left turn at the second chicken house," Hullar says. "He and his assistants duct-taped the gyroscope to the bull's horns and let him into the ring." As the bull bucked and trotted around the ring, the device recorded its head movements. When the researchers went back to the lab and analyzed their data, they found the speed of the bull's head motions while trotting was remarkably similar to that of the dolphins' while swimming. The speed of the bull's head motions during bucking was like the dolphins' when they spun in the water. "A few years ago, our lab was the first to record the nerve signals in mouse balance systems, and we showed that the smaller an animal's semicircular canal, the less sensitive it is," Hullar says. "Smaller canals, such as dolphins', would provide the animal with less information about motion. A dolphin's head is certainly large enough to hold a larger balance system, and because we've found their small canals aren't related to head motion, the question as to why they are so small remains open." Hullar will continue to try to answer this question by looking at the nerves that are linked to balance systems to see if the explanation lies in some aspect of nerve transmission or brain processing. In addition, he is working to build experimental models of semicircular canals using computer programs so he can test the effect of various movements on their function.